Ready to publish your B.A.T. Missions/Campaigns? hang on a minute! Topic: Ready to publish your B.A.T. Missions/Campaigns? hang on a minute! I have seen downloads with skins inside the campaign folder! Why oh why? This way we can just move safely all the files to our B.A.T. install or better yet, activate them with JSGME! This will prevent players from using the wrong module and get frustrated. Furthermore Campaigns and Missions are differentiated from stock or other Missions/Campaigns. Re: Ready to publish your B.A.T. Missions/Campaigns? hang on a minute! After reading your comment about the fact that Mission folder is shared by all modules and it does not participate in the modular nature of BAT, I recalled how I managed to make ranks and award specific era (see my Dedicated Great War awards and ranks thread in DOF Campaigns forum). I've tried to clone this method with the campaigns themselves, pasting them in BAT root folder > #DOF2 > MAPMODS > Missions > Campaign, as I did with awards. But strangely it didn't work. I don't know why the game is able to read award.mat and award.tga files, but it does not recognise campaign folders placed in the same pathway. Maybe someone wiser can figure a feasible way to get use of the modular nature of BAT to place campaign in era-dependant folders. Until this is solved, I support Whistler suggestions. Using consistent names for campaigns, beginning with BAT-DOF..., BAT-TGA..., etc; or as Monty does, beginning with the year in which the campaign is set (1914_BLERIOT, 1916_VERDUN...) is a good idea to guide players towards the proper module in which campaigns should be played. By the way, your comment about activating Skins through JSGME made me think to try something similar with different versions of my awards sets. I've tried and it WORKS! Thank you very much. It will be very useful when WWI German awards should be made! I agree that all missions/campaigns/skins/awards etc . can be easily handled with JSGME. That is how I'm doing it now, keeping all the missions in era dependant folders in BATMODS directory, so I can use jsgme to switch to era interested in and not have the Missions folder populated with everything for all. However, I also agree naming things appropriately makes it easier to populate my mod folders, any extra guidance helps. Of course, one can always figure these things out, but making life easier would be appreciated. But I'll take BAT campaigns and missions anyway they come, organized nicely or not. I did followed your DOF Dedicated Great War awards and ranks thread and downloaded the first pack this week. I was really impressed by the PDF you put together! Very good job and looking forward to a permanent implementation in B.A.T. I then downloaded all - let's call it - 'official or B.A.T certified' Campaigns and missions (from the fact that they are found in the BAT Missions and Campaigns forum section) and other campaigns reported as B.A.T. compatible and I also have many zipped campaigns from C.U.P. times that I would like to revisit and test. I was overwhelmed by the amount of time it took me to figure out how to make some sense of everything. 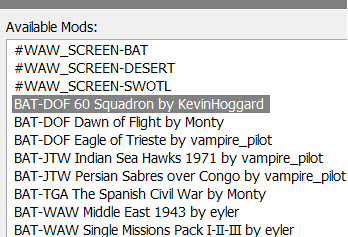 I wasn't just downloading, unzipping and moving files and folders around but I had to do it in a way that had to make sense in the future when deciding what campaign I would be flying next. I remembered you explaining about the Missions folders in the different modules and believe me I tried to run campaigns from #DOF2, #WAW2... It didn't work for whatever unknown reason, just like you found out today. In the end I decided to activate and deactivate campaigns via JSGME so I took the time to understand how each campaign was intended to be run by the author. It breaks my heart to see people spend so much time building and putting all these wonderful campaigns together and then some provide very little or difficult to find/understand info about how to run them! Mission builders should not take for granted players know all things IL-2. @gmkump, JSGME works for me now too, I feel I have some kind of visual control of what is available and active and what is not. My C.U.P. Missions folder was a real mess and I won't allow it to happen again. I've been testing your suggestion about creating JSGME entries to activate and deactivate campaigns at will. It is a very interesting tool, and it permits to tidy up the campaigns folder. However, I've found a little problem that I also experience when tweaking with my awards folders. If you delete a MAPMODS > Missions > Campaign folder, or via JSGME deactivate a campaign folder, it seems that all your campaign profile is lost. This makes that all your progresses in all the campaigns you are playing at the moment are terminated. Most BAT updates recommend to unselect JSGME mods, so my advise is to be careful with campaign JSGME management if you are in the middle of a campaign (I need more checking, but it seems that any changes in any module can lead to a deletion of ALL campaigns you are currently playing). JSGME is a very promising tool for campaign managment, but more test are needed to prevent data losses. All is good as long you as you do not go to "Pilot Career". I was happily flying my DOF campaign, read your post, activated a TGA campaign, ran TGA, started a new career, where is my DOF campaign? Oh well... went back to DOF and my progress was gone for good. Thanks SpongeBob! This is true whether you use JSGME or not. I hope an elegant solution is found one day... In the meantime, one campaign at a time! Well, I've found a solution, although I wouldn't called it 'elegant'. The key is using different pilot profiles. I've created four pilot profiles, one for each era (I named them DOF-whatever, TGA-whatever, etc, to easily recognise them). In Users folder, I've copied the settings of my original profile to settings in all new profiles. Now I have a specific pilot to be used for each era. I've also kept the default profile. Provided you are cautious enough to select only the corresponding profile to the active module, and you have activated the missions for this module via JSGME, changes in other modules won't affect your career. For example, I've activated DOF campaigns with JSGME, opened IL-2 DOF module, selected my DOF profile, begun a DOF campaign. Before shutting down, I've selected default profile. Now, I have deactivated DOF campaigns via JSGME, launched IL-2 DOF, selected default profile and gone to Pilot Career. Obviously, campaigns weren't there. Now, shut down, activate again DOF campaigns in JSGME, launch IL-2 DOF, select my DOF profile, and 'voilà', there were my intact campaign! I hope you can understand this convoluted explanation. The secret is having one profile for each era, and be careful not to select the wrong pilot in the wrong module. Default pilot can be used as a firewall, and to see what campaigns are activated or not without spoiling your progress. In the same spirit there is nothing preventing you from adding a prefix to the missions files themselves. I got into doing this because I use a single folder for all missions across my installs (with symbolic links, guys who do not know about the feature should have a look...). Then I copied the settings from the original profile to the others and as you say "voilà" I can play different campaigns using different modules! And like KevinHoggard says I guess it is just a matter of getting used to switching pilots/profiles. Very well done SpongeBob and many thanks for your support with this! Once again, it puzzles me how (some) artists dedicate hours and hours creating cool campaigns for others to enjoy and zip and upload their files without a second thought. I'll take BAT campaigns and missions anyway they come, organized nicely or not.